The key to solving one of the great puzzles in evolutionary biology, the origin of vertebrates -- animals with an internal skeleton made of bone -- has been revealed in new research from Dartmouth College and the University of Bristol. Vertebrates are the most anatomically and genetically complex of all organisms, but explaining how they achieved this complexity has vexed scientists. The study, published today [20 October] in Proceedings of the National Academy of Sciences claims to have solved this scientific riddle by analysing the genomics of primitive living fishes such as sharks and lampreys, and their spineless relatives such as sea squirts. Alysha Heimberg of Dartmouth College and colleagues studied the family relationships of primitive vertebrates. The team used microRNAs, a class of tiny molecules only recently discovered residing within what has usually been considered 'junk DNA', to show that lampreys and slime eels are distant relatives of jawed vertebrates. Alysha said: We learn from our results that lamprey and hagfish are equally related to jawed vertebrates and that hagfish are not representative of a more primitive vertebrate, which suggests that the ancestral vertebrate was more complex than anyone had previously thought. The team went on to test the idea that it was these same junk DNA genes, microRNAs, which were responsible for the evolution origin of vertebrate anatomical features. They found that the same suite of microRNAs were expressed in the same organs and tissues, in lampreys and mice. Unfortunately the logic is flawed because it is heavily biased. It is also equally probable that the said Micro RNAs have the exact same function in so-called primitives as it does in man. It is equally valid that it could be a common design feature and not a hereditary trait. The researcher does not explore this option because of his/her predisposition towards evolutionary thinking. There is just no way of knowing how the skeleton evolved since there's no documentation that shows it evolved. The mystery might be solved for evolutionists because it presents them with a plausible scenario as to how it could have happened and because of that it will become an evolutionary truth - regardless of what actually might be the case [ e.g. a common design feature ]. Upon delving deeper into the so-called junk DNA, more and more complex functionality and processing will be discovered which will simply thrash this theory. I doubt the evolutionists will retract this bit. What would it take to convince you, along with all the other creationists, that evolution qua natural/sexual selection occurs on what you call both the micro- and macro- (stupid distinction, by the way) scales? It's extremely obvious that you just *can't* accept evolution for what it is--or at least what other, more educated people accept it as. If you're unwilling to be convinced why bother posting here? We want profitable, open discussion--not dogmatism like you're probably used to every Sunday morning. Errr.., Documentation usually comes much later in the story of life as documenters would have to evolve to the point where they can document. And the process of documentation itself evolves as it takes all available paths as can be perceived by different branches of documenters who themselves branch off by branching the process of documentation, creating a positive feedback within their branches thus perpetuating the evolution of their branch. 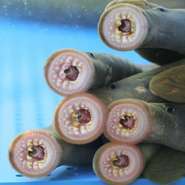 Perhaps lampreys and hagfish were 'designed' to appear as relatives to vertebrates. The same way you were designed to seem related to your parents. Besides, what is the problem with designed things being evolutionary? The computer used here is clearly both designed and evolutionary. There are only slight differences between this computer and a related 1 year older computer. Also between that computer and one 2 years old, and so on to the first digital computer, which had an eerily similar design to the non-digital computers before it. Engineers have just been designing components based on already working devices.